I don’t know if this exists in other countries, but in Canada there are large bins placed around major cities where people can recycle their old clothing, shoes, and accessories. Considering the bins inevitably have the word “donation” emblazoned on them, it’s assumed that charitable organizations collect the items in order to earn revenue by reselling the pre-loved items. In such a scenario everyone seems to win; the charity makes some cash to help fund their operations, and the donor gets to feel good about recycling their old clothes and gaining back some closet real estate. But what you see is not always what you get in the world of clothing donations, and recent news headlines warn that donors are being duped by for-profit bins that masquerade as charitable receptacles. In late January, the Canadian Broadcasting Corporation (CBC) aired a disturbing story* about the underground economy of used clothing donations. 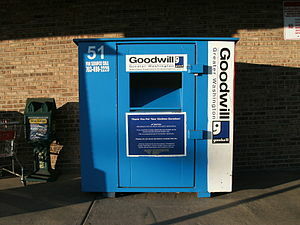 Reselling used clothing is a very lucrative for-profit business, and apparently many of the “donation bins” placed around Canadian cities are either loosely or wholly unaffiliated with non-profit organizations. Rather than benefitting charities, the contents of the bins are collected by private companies who then sell the items by weight to thrift stores and clients overseas. Considering thousands of dollars can be made each week in this line of work by both the drivers who collect the items and the middle-men who sell the goods, it’s no wonder that increasingly violent turf wars have been reported in some cities. I fully support social enterprise, and applaud non-profits who find innovative and lucrative means by which to earn much-needed revenue to support their aims. And I have no problem with a charity lending their name to a clothing donation bin in exchange for a portion of the proceeds – as long as they get their fair share, that is. But it disgusts me to know that profiteers are lining their pockets by misleading do-gooders into believing their well-intentioned donations are supporting legitimate charities. It is also worrisome to consider how this scam will impact non-profits who operate bona fide clothing donation bins. On a personal level, the thing that bugs me most about this issue is that I’m almost certain I was a victim of this scam for a length of time that I don’t care to admit. Unfortunately I have no way to verify this because the bin I used to frequent was removed a few years ago. But as far as I can remember, there was only a very vague reference to a charity on the box (something to do with a body part…kidney? liver?). Ugh. So much for being a good citizen. As with most things in life, it seems as though a little bit of research goes a long way in the world of clothing donations. Hopefully the upside of this scam will be an increase in donations to legitimate charities. When you know better, you do better…which is why all of my used clothes will now be taken directly to a local Goodwill Donation Centre. A little disturbing indeed. In the future I will be more careful about where I send my used clothing. That’s great to hear! I was hoping this post would help at least one person be more careful with their clothing donations. And thanks for taking the time to comment!